Free download Nero 2014 Platinum. It is pack of software developed by Nero Inc. Nero 2014 Platinum has all popular products from Nero such as Nero Media Home,Nero MediaBrowser, Nero Blu-ray Player, Nero Video, Nero Recode, Nero Burning ROM, Nero Express, Nero BackItUp and Nero RescueAgent. You can use all these software within a single pack which is Nero 2014 Platinum. The installation process of Nero 2014 Platinum is although very simple but it takes a lot of time to complete the process. You have to wait for a long time about 15-20 minutes because it is a complete pack of software. The setup will also ask you to install AVG toolbar package. You can accept or decline it during the installation. When installation will complete, Nero 2014 Platinum trial will open automatically. If you are connected with internet then it will ask you to buy it, activate it with serial key or ask to continue trial. You can select any option you want. 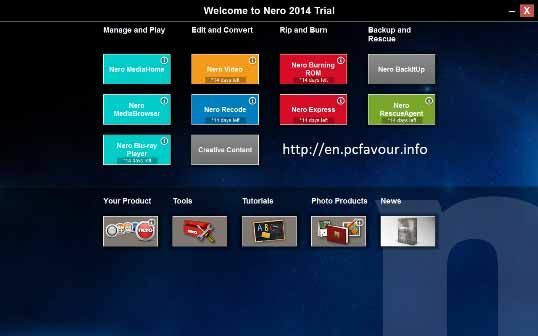 Using 14 days trial option will take you to the main screen of Nero 2014 Platinum. You will see the four columns each with same category which are Manage and Play, Edit and Convert, Rip and Burn and the last column has Backup and Rescue software. Nero MediaHome is very similar to iTunes. You can manage your photos album, videos and music lists and slide show. Nero Blu-ray Player will help you to play all Blu-ray Discs. It also supports DOLBY Digital Plus, DOLBY Digital, dts Digital Surround and powered by Java. So you can enjoy the variety of High Definition videos on your personal computer with the help of Nero Blu-ray Player. Nero Recode will help you to recode or convert your files. You recode or convert files by importing it or add it using drag and drop function. You can recode Blu-ray/AVCHD, Blu-ray/AVCHD structure, DVD or any DVD structure from discs. You can also convert any media files by importing videos, audios, importing form MediaBrowser or online videos. You can edit, export or burn videos using Nero Video application. You can Capture video from Camera or TV, record it directly to Disc, import from AVCHD or import any file. Edit function of Nero Video allows you to make slide show, express movie, advanced movie, open Nero Video Project, and open Windows Live Movie Maker Project. After importing and editing, you can create or export AVCHD™, Blu-ray Disc, DVD, Super Video CD and Video CD.